From the 1980s China has a more active foreign policy agenda and by the 1990s is contributing personnel to UN Peacekeeping missions. China is now the second largest contributor to the UN Peacekeeping budget. Peacekeeping contributions have steadily become an important part of China’s soft power strategy. China’s involvement forms part of a broader foreign and economic policy that is primarily centered on force projection and commercial interests. China’s peacekeeping initiatives have fostered cooperation and represent an opportunity to improve bilateral and multilateral relations. China’s historic isolationism and detachment from the rest of the world has undergone a radical shift since the end of the Cold War, as exemplified by its increased involvement in United Nations (UN) peacekeeping efforts, and more broadly, its support for UN institutions and initiatives. Historically, Chinese foreign policy was defined by a lack of international engagement and non-participation in multilateral organizations, such as the UN. Indeed, Beijing’s main focus was Taiwan and its relationship with what it considers to be a breakaway province. It was not until the 1990s that the Chinese policy towards peacekeeping started to shift, which was often in conflict with Beijing’s core belief of non-interference. Despite its views on the inviolability of state sovereignty, Deng Xiaoping’s time in office as Chinese leader from the late 1970s to the end of the 1980s did mark a softening in China’s position on peacekeeping and its broader engagement with the outside world. During this period, China began to contribute towards the UN peacekeeping budget and shifted its position in ways which allowed for the direct involvement of its personnel in missions from the 1990s onwards. Since the end of China’s Communist Revolution in 1949 and the development of Chinese and American relations from 1971, China’s foreign policy can be seen as limited, particularly in relation to UN engagement. Except for issues related to its claim of sovereignty over Taiwan, and Bangladeshi independence from Pakistan, Chinese policy was defined by its non-participation and abstentions in the Security Council throughout the Cold War. The continuation of this policy was evident when China peacekeeping resolutions for Guatemala and Macedonia in 1997 and 1999 in response to those States recognizing and establishing diplomatic relations with Taiwan. Placing such a fundamental importance on the pillar of state sovereignty has been a guiding principle for Beijing. This was the primary factor in its opposition to peacekeeping missions Not maintaining its neutrality and undermining the principle of sovereignty was seen as a threat to its own internal security, from the Xinjiang, Tibet and Inner Mongolia autonomous regions, as well as its claims over Taiwan. It is these provinces that China sees as providing a border security and protection from external aggression. Issues of sovereignty go hand in hand with human rights records and economic sanctions, which China faced after the suppression of the Tiananmen Square demonstrations. It is, therefore, a sensitivity to its own history and confrontation with international powers, including Britain, Japan and the United States, that has determined Beijing’s hostility to interference in internal affairs. Peacekeeping, by its nature, is interference. Furthermore, Washington’s push to advance international mechanisms and institutionalize “humanitarian intervention” in the early 1990s, particularly in Yugoslavia, was viewed as a threat “as a way of ensuring America’s ability to intervene in China”, especially in Tibet. The PRC’s foreign policy objectives changed in the late 1980s in response to the economic reforms of Deng Xiaoping, while at the same time Tiananmen Square harmed its international reputation. Both factors necessitated an expanded international presence in order to improve standing, perception, and international cooperation. Peacekeeping contributions have, however, steadily become an important part of China’s soft power strategy, allowing Beijing to advance its interests abroad while fostering collaboration with other nations, as it undergoes its so-called “peaceful rise”. By engaging in peacekeeping operations – and by extension non-violent intervention and recourse to diplomacy – Beijing is attempting to balance out the perception of China as a threat. A significant increase in peacekeeping contributions took place in 2003 and 2004, which coincides both with its rising prominence as an economic power and the U.S. invasion of Iraq. Therefore, the opportunity was seized to be seen as both a great power and ally to developing states. Peacekeeping proves a low-cost method of proving China’s commitment to global stability. China recognizes that upholding international stability, as well as international institutions and mechanisms, is vital to Chinese economic and political interests. As the primary beneficiary of the post-Cold War order, both economically and politically, China is invested in maintaining this system. Economics is a primary motivator, particularly in Africa where Beijing has significant oil and mineral interests in nations such as South Sudan. China’s desire to maintain stability provides protection for its national interests – expanding commerce and trade, and by extension its long-term access to resources, contracts, and markets. Peacekeeping, therefore, forms part of a broader foreign and economic policy that is primarily centered on force projection and commercial interests, such as its “Belt and Road Initiative”. The recent increase in UN involvement has made China the third-largest contributor to the UN budget, the second highest contributor to the UN peacekeeping budget, and the 12th highest provider of peacekeepers, with 2,634 personnel as of January 2018. It is also the largest contributor of the permanent members of the Security Council. Throughout its efforts, China has broadly adhered to traditional peacekeeping principles of impartiality and neutrality. Its participation in peacekeeping missions had been limited to sending passive military observers and support, in the form of engineers, medical teams and logisticians in earlier operations, such as the UN’s Advance Mission in Cambodia between October 1991 and March 1992. Support troops, which do not carry out a mission’s mandate, are in short supply but essential to a mission’s effectiveness. China’s presence followed its participation in the Paris Peace Accords for Cambodia and diplomatic support for a peaceful transition and reconciliation government, which ended Cambodia’s internal conflict that began after Vietnam’s removal of the Khmer Rouge regime. Its involvement in the East Timor UN mission from January 2000 onwards, where it sent its first active civilian police officers, marked a shift in the willingness of the Chinese to engage more proactively in peacekeeping operations. Nevertheless, Beijing’s risk aversion has steadily given way to participating in in Mali, South Sudan, the Democratic Republic of Congo (DRC) and Darfur, which include civilian protection and humanitarian aid. Africa-centric, as of 2017, China contributes 410 support troops in Lebanon, 141 police in Liberia and has small troop contingents in Western Sahara and police in Cyprus. Operations in Africa have given them the opportunity to “enhance the operational capacity of PLA (People’s Liberation Army) units”, as well as improve its global reputation. China has placed an emphasis on humanitarian aid operations, cooperating with the Association of Southeast Asian Nations (ASEAN), Australia and the U.S., with its early experience tied to successful evacuations in Libya and Yemen. Overall, the PLA appears to have demonstrated its utility and effectiveness in peacekeeping and humanitarian missions as well as disaster relief and evacuations. October 2003 – China sends peacekeeping troops and other logistical personnel to the UN mission in Liberia, by far its largest military contribution to an operation up to this point. August 2008 – China opens a UN peacekeeping police training center for its own civilian police to train, as well as those from across Asia. On 25 October 1971 – the Communist-led People’s Republic of China is admitted into the UN, replacing the Republic of China as the sole Chinese representative of the Chinese state. December 1981 – China agrees to fund UN peacekeeping operations for the first time, which it had declined to do since its entry into the UN a decade earlier. December 1988 – China joins the UN Special Committee on Peacekeeping Operations, signaling its intention to participate in future peacekeeping missions. April 1990 – The country joins its first military peacekeeping operation by deploying five observers to the UN Truce Supervision Organization in the Middle East. April 1992 – In China’s first major peacekeeping operation, the country sends nearly 50 military observers and 400 military engineers to the UN Advance Mission in Cambodia. May 1997 – China agrees in principle to join the UN’s Standby Arrangement System, displaying an increased willingness to more actively engage in peacekeeping missions in the future. July 2016 – China becomes the second-largest financial contributor to the UN peacekeeping budget at just over 10 percent, surpassing Japan, though still far behind the U.S. In a departure from its traditional support work, Beijing contributed “comprehensive” security forces to Mali in 2013. With a stabilization mandate, China sent 403 soldiers to the northern Gao region of Mali primarily tasked with engineering projects. Since 2014 in South Sudan and Darfur, China has followed the wider trend in peacekeeping operations, which involves expanding the UN’s limited military capabilities to include intelligence, drones, and attack helicopters to meet the asymmetrical warfare threat posed by non-state actors. In 2015, it sent 1,031 combat troops to South Sudan (UNMISS) and a helicopter squadron to Darfur. China’s move to widen its mandate highlighted a shift in the country’s standing on the global stage, and its apparent interest in taking on the role of a global leader. In January 2016, Beijing played an instrumental role in brokering a cease fire agreement between the South Sudanese government and rebel fighters. Under the auspices of the IGAD+ (Intergovernmental Authority on Drought and Development), a consortium of East African states in addition to non-regional actors and international organization such as the U.S., Norway, the UN and the EU, Chinese mediators attempted to help guide the peace process. Ultimately, however, the fractious peace collapsed in July 2016 when fighting erupted in Juba, leaving 300 people dead including two Chinese peacekeepers. China’s UN contingent would later face criticism for allegedly firing teargas on civilians seeking shelter and abandoning their posts once they came under direct attack. More broadly, some analysts argue that China’s presence in South Sudan has been criticized as not amounting to peacekeeping and international aid, but rather foreign investment with expected returns. On the other hand, this mission was also the first major peacekeeping operation that the Chinese were involved in and the situation in South Sudan is unique, extremely volatile and filled with challenges that are beyond the scope of a peacekeeping mandate. China’s continued engagement in peacekeeping missions appear to be assured for the foreseeable future with the September 2017 registration of 8,000 troops for the UN’s peacekeeping standby force, 800 of which will join the UN’s Vanguard Brigade, a rapid response unit. Meanwhile, Beijing is close to completing a military base in Djibouti, which is a transit hub for its humanitarian work in Africa and the Middle East. However, the UN Secretary-General’s agenda of early conflict prevention, would if successful, leave China in a more comfortable position – allowing it to avoid interfering in the domestic affairs of other states. By providing early identification and support to stop armed conflicts before they begin, China’s local and international image might be further enhanced. China’s peacekeeping operations fit into the wider themes enshrined in the CPC constitution, where a rise in Chinese military might and political clout, coincide with the promotion of the concept of “Socialism with Chinese Characteristics”. Xi Jinping’s stated goals are to provide a greater contribution to humanity and promote the goals of world peace, all the while respecting international law and state sovereignty. Although this is a fine line to balance, Xi’s enhanced mandate in peacekeeping does reflect an alignment of UN and Chinese policy goals. This is one reason why Beijing has made significant financial contributions as well as increases in military personnel and equipment. 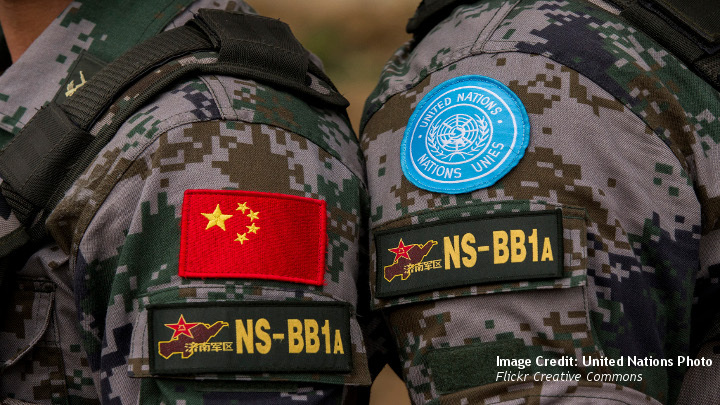 While it pursues its broader foreign policy objectives, without necessarily compromising, China has made a positive contribution to peacekeeping efforts. Its support troops are widely hailed in Africa as a positive force due to their low visibility and cultural sensitivity, while its helicopters and funding have expanded the UN’s peacekeeping capabilities. However, the prioritization of its economic interests and its slow pace in meeting international norms like human rights, are problematic. The PLA could benefit from taking on further responsibility in command and deployment missions as this would increase operational capability and knowledge. China’s peacekeeping initiatives have fostered cooperation and represent an opportunity to improve bilateral and multilateral relations.